Epoxy laminated panel heater installation. If you’re looking for an excellent external tank heating solution you may want to consider epoxy laminated panel heaters (ELPs). The heaters provide a low watt density heating profile, and along with their inherent low mass, ELPs provide excellent thermodynamic performance. These electric heating panels use a flat foil resistive element laminated in a multi-layer fiberglass “sandwich” using epoxy resin. Manufactured under tightly controlled heat and pressure to assure bonding and structural integrity, the resulting heater is a water-proof and durable semi-flexible heating panel. Epoxy laminated panels are used in a variety of applications, from freeze protection to process heating. They are used on either vertical or horizontal metallic or non-metallic tanks with diameters of 48" and above. They are also applied in dry or wet areas, corrosive environments, and carry FM approval for hazardous area use. No special tools or skills are required, so they are quick and easy to install. Typically the ELPs are installed by banding them to the tank with metal bands or polyester straps, taking just a few minutes. After installation, adhesive aluminum tape should be applied to the edges of the heaters to act as a seal, preventing thermal insulation becoming trapped between the heating panels and the tank. 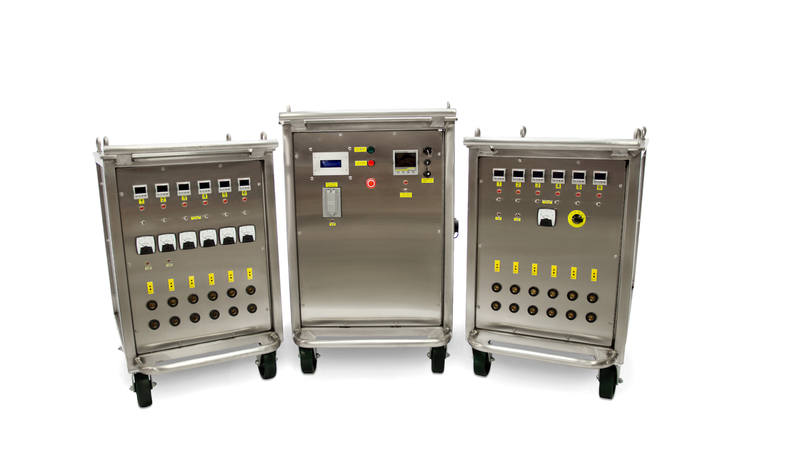 The fiberglass enclosure is UL/CSA listed for use in NEMA 4, 4X, 12 and 13 environments. 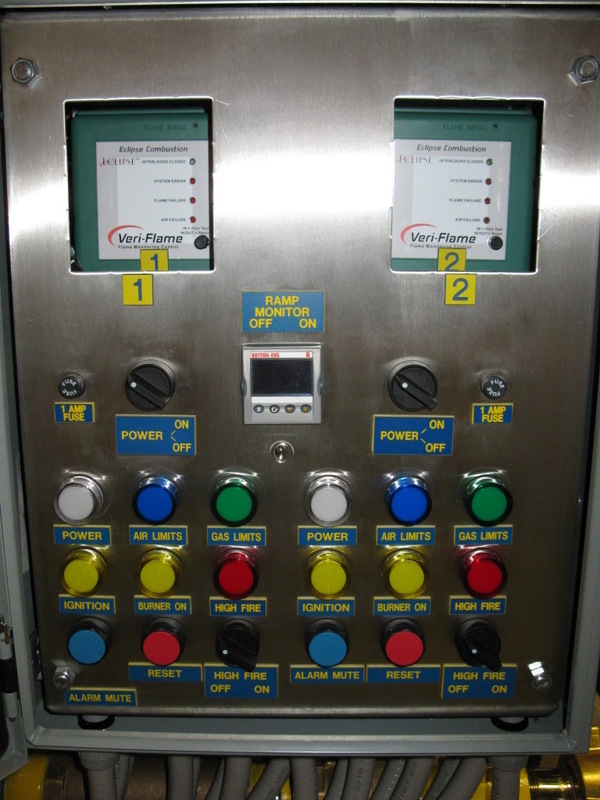 Employing two electronic controllers, the assembly can be used for a variety of tank and pipe heating applications requiring reliable control. 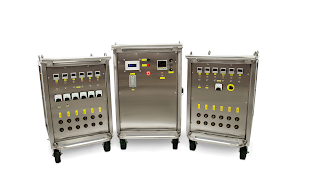 Components carry UL, CSA, and CE approval with internal wiring that is NEC and IEEE compliant. The complete assembly can be provided with a UL/CUL approval stamp per customer request. 240 Volt Dual Electronic-Thermostat Tank Heating System Controller from Hotfoil EHS, Inc.
Hotfoil ELP heating panel construction. With winter around the corner, manufacturing plants need to consider the possibility of freezing or low process temperatures effecting outdoor storage tanks and transfer vessels. The most common approach is to install electric heating panels on the outer surface of these tanks and vessels to prevent the contents from freezing. Lower than normal ambient temperatures can also have negative effects on the flow of liquids for a given process. In these situations it is important to maintain liquids at a constant temperature. Electric heating panels are easy to install on tanks and vessels and provide the flexibility to heat a large area of the tank surface. They can also be used to target heat to specific areas on a tank. Hotfoil ELP heating panels are suitable for installation on metallic tanks and vessels for freeze protection or process temperature maintenance up to 79°C/175°F. They incorporate flat foil resistive elements that are laminated by heat and pressure in a multi-layer fiberglass construction with epoxy resin. The resulting electric heater design is a semi-flexible panel that is waterproof and durable. 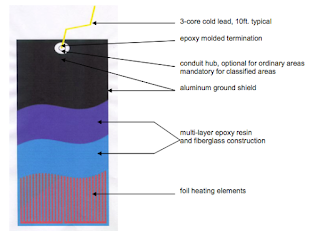 They are used in a variety of heating applications spanning from freeze protection to process heating with exposure temperatures ranging from -40 F to +212 F.
ELP heating panels can be used on either vertical or horizontal tanks with diameters of 48" and above, with either metallic or non-metallic construction. They can be used in dry, wet, or corrosive environments, are available in 120 and 240 volts, and are approved for hazardous and non-hazardous areas. On October 4th and 5th Canada's largest welding, fabricating, and metal finishing conference is taking place in Edmonton, Alberta. The CanWeld Expo is described as "the only Canadian-made major exhibition dedicated to welding, metal fabricating and finishing. 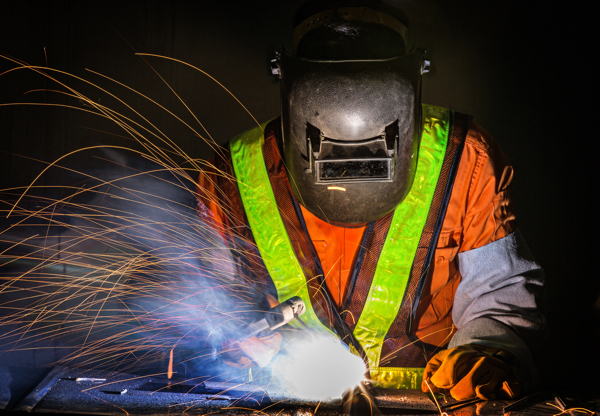 Held in partnership with the Canadian Welding Bureau’s award-winning CanWeld Conference, this annual event will visit the centre of Alberta’s manufacturing heartland – Edmonton. This location also aims to service the region’s active oil & gas, petrochemical, agriculture and general manufacturing supply chains." 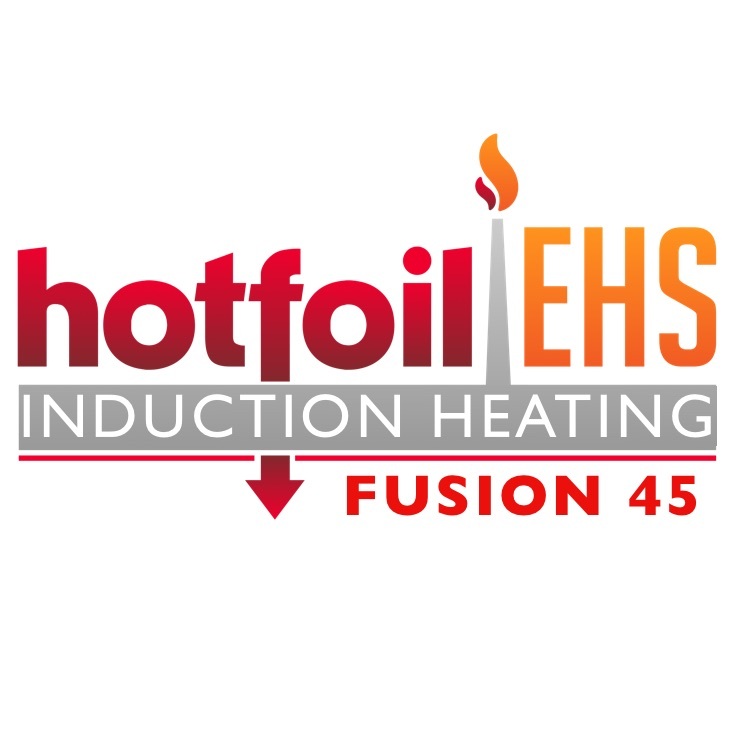 Hofoil-EHS will in exhibiting as a guest of Stein Industries in London, Ontario. Stein will be exhibiting its high quality, custom designed, affordable induction heaters built to withstand harsh environments with wide applications. This is a great opportunity to see major welding equipment vendors and new technologies being introduced. If you plan on being at CanWeld, please stop by the Stein Industries at booth 820 in the Main Hall. Weld preheating involves heating a section of, or the entire part, to a specific desired temperature, generally referred to as the preheat temperature. The heating may or may not continue during welding, dependent on the heat generated by the arc. The goal is to maintain a certain temperature from the first weld pass to the last. Preheating produce several very beneficial effects, including producing a more ductile metallurgical structure that cracks less, helps in releasing trapped hydrogen, and reduces stress cracking during cooling. It is always recommended that you should consult with weld heating experts and learn the fundamentals of this process in order to avoid costly errors in preparation or wasting money on the using the wrong equipment. Here is a very general diagram of the typical welding pre-heat equipment layout. One of the oldest welding technologies still in use today is resistor controlled arc welding. The technology is old, but when combined with more modern controls, provides exceptionally high quality performance. Resistor controlled arc welding incorporates edge-wound resistors using a special current-controlling alloy. From the 1930’s until 1990, nearly all Multiple Operator Systems were the same general layout – a big bulk power supply, with “grids” connected by means of cable to form a system of distributed power. 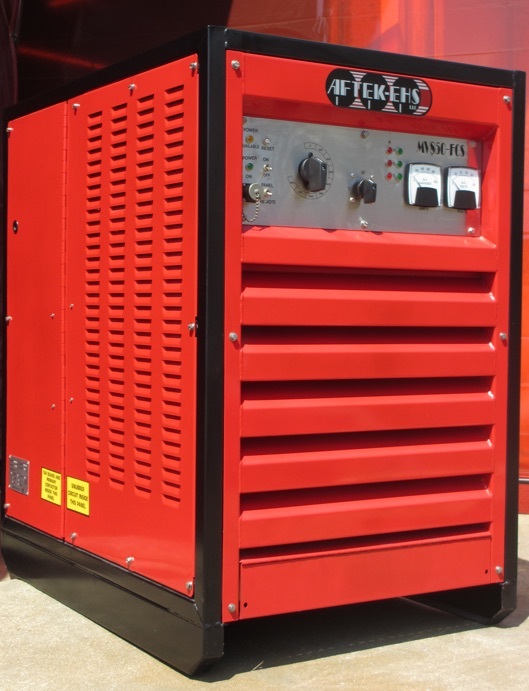 Originally designed for use in shipyards, this system minimized the use of high voltage primary power, distributing 75-80 volts of secondary voltage instead. 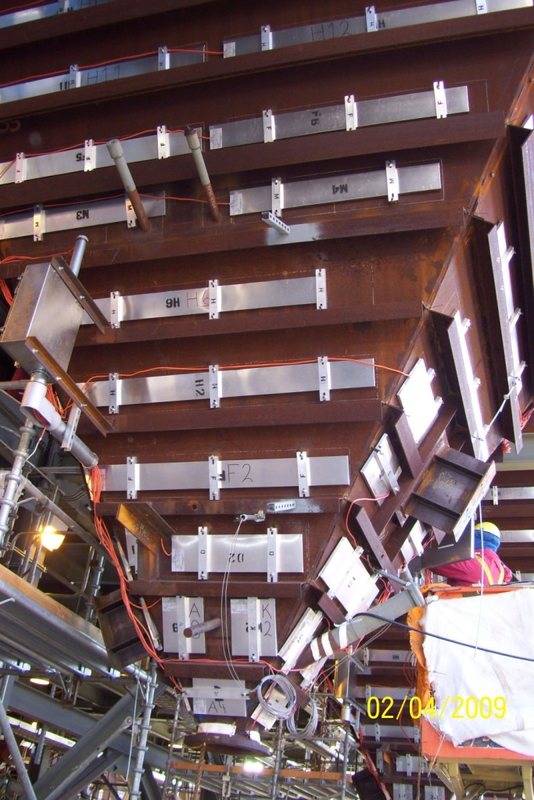 Historically, the most common application of resistor controls has been in Multiple Operator Welding Systems, widely used in shipyards and heavy construction. Nearly all the Nuclear Electric Power Plants were built using Multiple Operator Systems. 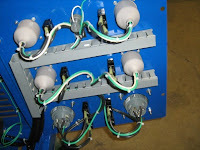 Big Four Manufacturing Company of Saint Louis, Missouri, pioneered the concept of connecting Multiple Operator systems in a complete loop configuration. This LOOP concept greatly improved the voltage stability of Multiple Operator systems, because with all the power connected to a single circuit, voltage drops were reduced or eliminated due to the nature of a DC circuit. In 1977, Big 4 Manufacturing introduced their innovative and very successful Series 77 Control. After the Three Mile Island incident and the subsequent slowing of the Nuclear Power Industry, Big 4 decided it was in their best interest to expand into the general fabricating, refinery and petro-chemical markets. Their popular soft arc was great for most welding, but was inadequate on pipe root passes with 5P, then the most common method use for oil related pipe. To provide an arc better suited for pipeline, Big 4 devised a circuit to make their resistor grid “think” it was a Lincoln generator. They called this new system “Arc Ram”. Arc Ram worked beautifully with 5P and similar electrodes and led to the design of a MIG system which they called Demand Pulse. "Short-circuiting Metal Transfer" (Short Arc) welding was introduced by Linde in the late fifties for welding sheet metal. During the 1960s, short-arc became widely used, sometimes for the wrong applications. When using short-arc the wire can contact the molten weld pool resulting many times with the weld not fusing to the base metal. This is called a "cold lap". Cold lap associated with Short Arc became a reason why many welding shops won’t use “wire” welding processes on pressure welds. 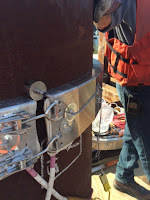 Unfortunately, mis-used Short Arc welding gave ALL GMAW welding on pressure welds a bad name. Demand Pulse rarely extinguishes the arc. Metal transfers through the arc, and the arc’s are much shorter than those from Pulse Spray. The transfer occurs above the molten pool, so spatter doesn't explode from the puddle. It is a "constant current" process. 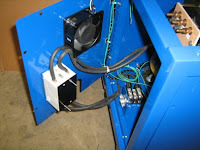 The operator selects a base current, similar to some GMAW Pulse Spray applications, adjusts the wire feed speed to give the correct voltage, and begins to weld. Lower voltage will cause the puddle to freeze faster, higher voltage will cause the puddle to be more fluid. In short arc, a current pulse is triggered by the short-circuit condition caused by the wire driving into the work piece. Demand Pulse forces the transfer to occur before short-circuit, at a voltage selected by the operator, above the weld pool. This has two important effects: the arc does not extinguish and the spatter level is greatly reduced because the molten tip of the wire does not contact the weld pool. Because the arc is not extinguished, cold laps are virtually eliminated. Many reference books describe short arc as a "random pulse" method of welding. Random in the sense that the pulse is triggered as a function of wire feed speed. The faster the wire feed speed, the faster the short circuits (pulses). Demand Pulse is exactly the same, except it does not short! 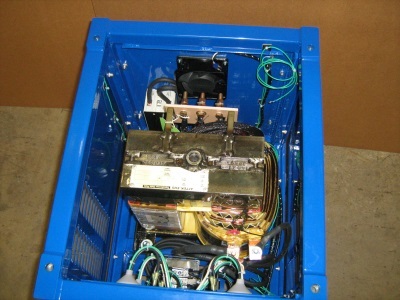 This blog post was abstracted from a 2004 press release from Aftek Welders, the only remaining company providing resistor controlled welding machines, and parts supplier for all Multiple Operating Systems. You can read the full version of "AFTEK – the Best Welders you never heard of…” here. Just a short video on Hotfoil EHS pre and post weld heat treating mat heaters (also known as pad heaters). 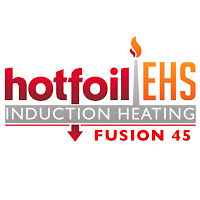 We just introduced a new Hotfoil EHS Welcome video for our YouTube Channel. Check it out! The most important feature of a resistance heater is the ability to transfer the heat away from the resistance wire to the outer covering where it can be absorbed by the work piece. Even when accurately controlled, a poorly designed or poorly applied heater can cause the wire temperature to exceed the wires operational limits. 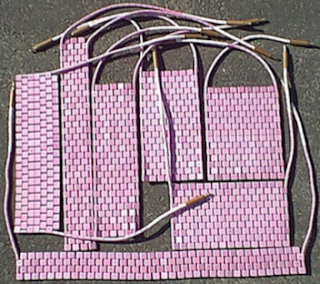 Ceramic mat heaters, also known as ceramic pad heaters, are designed to produce more even and efficient heat transfer while maintaining maximum flexibility. 1) Sintered alumina oxide is formed into shapes and fired at precise temperatures to produce a ceramic insulator with a combination of high dielectric strength and efficient, fast heat transfer. This ceramic is also solid enough to withstand physical shock and resistance to oxidation and corrosion from a broad range of chemicals and atmospheres. 2) An accurately measured length of stranded nickel-chromium wire is precisely wound through the ceramic beads ensuring electrical isolation to produce a compact and flexible resistance heater. Suitable for operation at 2000 deg. F.
3) The resistance wire is then metallurgically bonded to a stranded nickel-copper wire to provide trouble free electrical continuity. The flexible stranded cold junction wire is connected to brass Twistlock connectors fitted with insulated sleeves. The cold junction extension leads are rated for 250 deg. C continuous temperature. Ceramic mat heaters are efficient, time-tested, and proven heater technology in pre-weld and post weld heating, and are designed for the harsh realities of the welding environment. 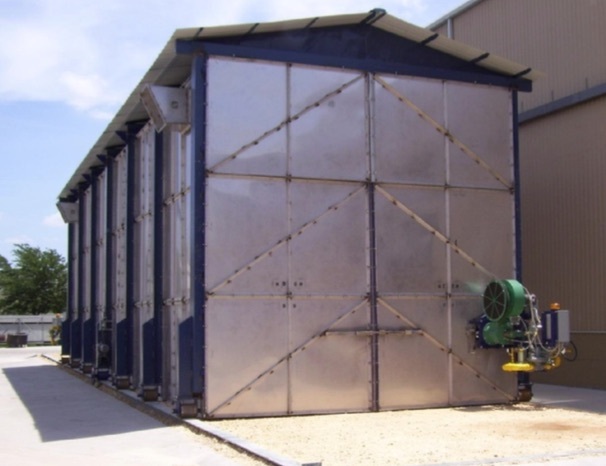 When it comes to heating process tanks electrically, you have two options - immersion or externally mounted panels. Immersion heaters must penetrate the tank wall, or be placed of over-the-side in an open top tank. Both approaches add cost and/or safety considerations. Sometimes entry to the tank may not be possible at all. A good alternative are electric heating panels. 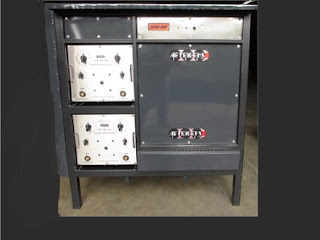 One type of exterior heater design, the epoxy laminated panel (or ELP), is a very versatile tank heater. Possessing unique flexibility, ELP heating panels can be used in a variety of heating applications ranging from freeze protection to process heating up to 212 deg. 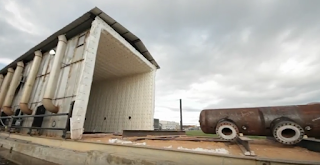 F . These panels can be used on either vertical or horizontal tanks of metallic or non-metallic construction. They can be used in dry, wet, or corrosive environments in ordinary or approved hazardous locations. ELP heating panels are quick and easy to install, require no special tools or skills. Heaters are usually installed by banding them to the tank with metal bands or polyester straps. Installation of several ELP heating panels takes only a few minutes. Check out the following document for more information on the epoxy laminated panel heaters. Epoxy Laminated Tank Heater Panels from Hotfoil EHS, Inc.
Hardness testing is an easy and informative test to learn important information about material properties. For most general applications, hardness can be described as the property a material has to resist indentation. In welding, its important to measure hardness of welds for quality and material compliance. Various methods and procedures are used to measure hardness. One method is to create a "dent" on a target material (under controlled conditions) and then carefully measure the resulting indentation. The indentation correlates directly to the hardness of the material. In very general terms, the smaller the mark, the harder the material, and the larger the indentation, the softer the material. The Brinell Hardness Number (BHN) and Brinell testers are very popular. 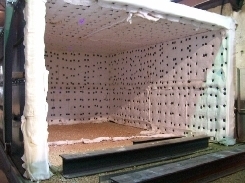 Brinell testing is done by pressing a perfectly spherical ball (10 mm in size) into a target material with a force of over 6600 lbs (3000kg to be exact) for a minimum of 10 seconds, and then measuring the resulting impression. After which, the size of the impression is measured by an optically scaled microscope positioned over the impression. 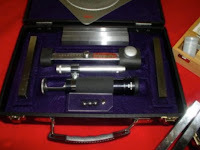 Laboratory Brinell testers are obviously impractical in the field, but portable, lightweight Brinell testers are available for weld hardness testing in the field. These portable testers are easily transported and simple to use. No special training is required and in a few minutes anyone can learn to determine a Brinell Hardness Number accurately. The accuracy of portable Brinell testers are done via NIST traceable test bars. The test bars are calibrated to a uniform hardness of ±3% of their labeled Brinell Hardness Number. Additionally, the microscopes used for measurement are capable of reading within .05 millimeters. A test bar with a known BHN, and approximately the hardness of the target material to be tested, is chosen. The test bar is inserted into the Brinell test instrument and the instrument placed upon the specimen. A steel impression ball, secured in the the head of the instrument, is in contact with both the test bar and the target material. Built-in to the test instrument is an anvil, which is then struck sharply with a hammer. Via the impression ball, the impact of the hammer, regardless of force, is transmitted equally to the test bar and to the target material, leaving marks in both. The diameters of the resulting indentations are directly related to the respective hardnesses of the test bar and the specimen. The bar is removed from the test instrument and the microscope is positioned over the appropriate indentation. The impression in the specimen metal is measured in the same manner and the hardness is determined. Welding is a process of joining materials, usually metal or thermoplastic, by causing a fusion at the junction of two or more physical parts. The fusion is accomplished through the creation of specific conditions at, and adjacent to, the joint area. Welding is a heat based process, but there are other heat based processes used for joining metals. The welding process differs from lower temperature joining operations, such as soldering or brazing, that do not require melting of the base metal. There are numerous welding methods, as well as specific procedures that are applicable to different metal alloys and intended use of the finished product. Some of these procedures involve controlled heating and/or cooling of the weld and the closely adjacent area of the parts being joined. 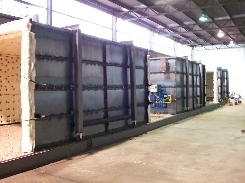 This is generally termed heat treatment, and more specifically, preheating and postweld heat treatment. 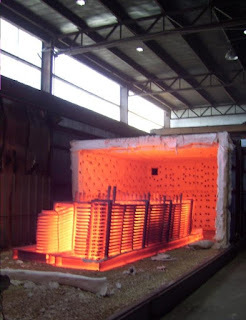 Heat treatment, in any form, is a time consuming and costly operation. Strength, toughness, corrosion resistance, and residual stress of the joint are all impacted by the proper application of heat treatment. Many application codes and standards require specific protocols for heat treating, which is utilized to achieve a specific resulting condition in the subject material or to restore material characteristics altered by production processes such as welding. 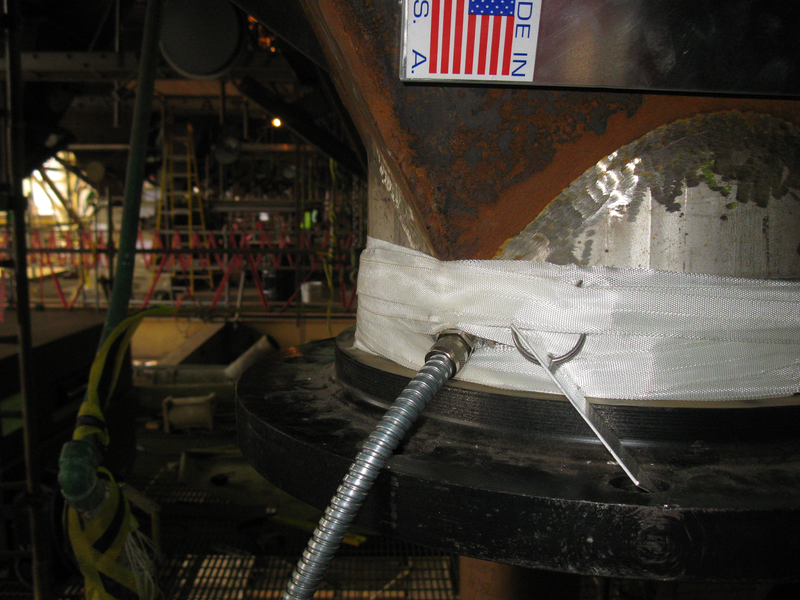 Stress relief is a benefit and goal of postweld heat treatment. During the welding process, base materials near the weldment, deposited weld metal, and the heat affected zones exhibit different levels of metallurgical phase transformation. Various degrees of material hardening occurs, particularly in the heat affected zone adjacent to the weld metal deposit, with high stresses due to melting and solidification. 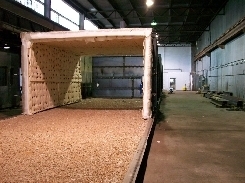 Stress relief through heat treatment is accomplished by controlled heating and cooling of the affected material area to relieve a significant amount of the imposed stresses. This postweld heat treatment can reduce the hardness and increase ductility, lessening the incidence of cracking in weldments. The process generally involves maintaining the target area at a specific temperature (soaking), then executing a controlled cooling schedule. The necessity for PWHT depends on the material and the service requirements. Other factors that influence the need for PWHT are the welding parameters and the likely mechanism of failure. In some standards, PWHT is mandatory for certain grades or thicknesses, but where there is an option, cost and potential adverse effects need to be balanced against possible benefits. The energy costs are generally significant due to the high temperatures and long times involved, but costs associated with time delays may be more important. Detrimental effects include distortion, temper embrittlement, over-softening and reheat cracking, which means that control of heating and cooling rates, holding temperature tolerances and the times at temperature are extremely important, and must be carefully controlled in order to realise the full benefit of the process. The precise level of heat control, as well as the substantial quantity of heat, required to successfully accomplish a PWHT protocol calls for the use of special purpose equipment intended for PWHT. 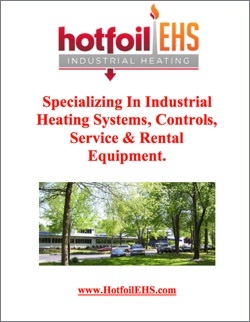 Hotfoil EHS is a recognized manufacturer of industrial application heating equipment and specializes in the design and manufacture of power consoles, ceramic mat heaters, and accessories for pre and post-weld heat treatment. Share your application challenges with them and work together to develop a cost effective solution. 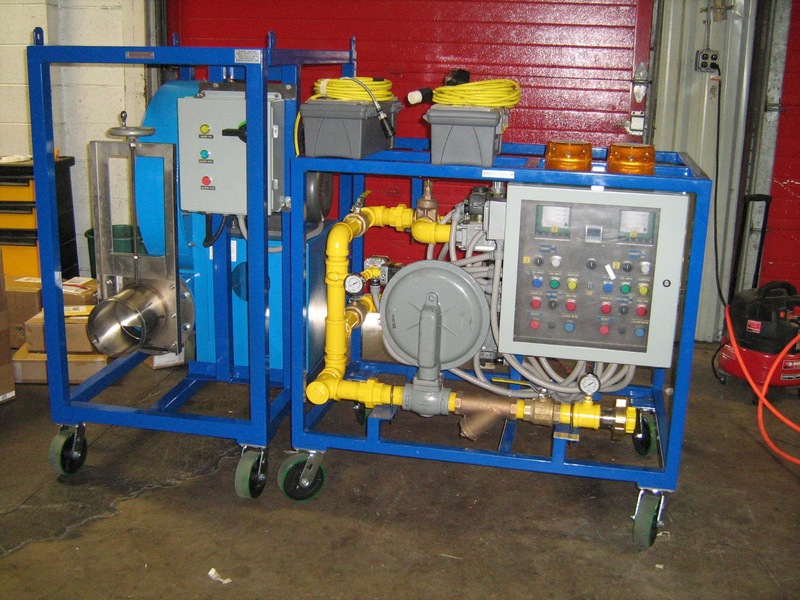 When it comes to selecting the right equipment for welding and industrial heating jobs, projects and tasks are best completed and accomplished through the proper application of the right resources. There exists an access point to high level technical knowledge and assistance that can be easily tapped and brought to bear on your successful task or project completion. The manufacturer's own internal experts. Product Knowledge: Product managers and sales support personnel will be current on product offerings, proper application, and capabilities. They also have information regarding what products may be obsolete in the near future. This is an information source at a level not generally accessible to the public via the Internet. 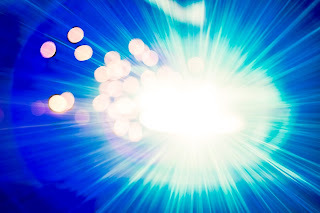 Access: Through the manufacturer's internal applications people, you may be able to establish a connection to “behind the scenes” information not publicly available. The people at the manufacturer can provide answers to your application questions. Certainly, any solutions proposed are likely to be based upon the products sold by the manufacturer. That is where considering and evaluating the benefits of any proposed solutions become part of achieving the best project outcome. Develop a professional, mutually beneficial relationship with the manufacturer's technical sales team, and don't be shy to develop a professional and trusting relationship. Their success is tied to your success and they are eager to help you. In metal working maintenance and repair, it is sometimes required to repair or replace a weld, or remove excess metal from a worn or defective part. A process called air carbon-arc (also known as air arc) gouging, developed in the 1940’s, has become a widely accepted method for metal working. Compared to grinding, chipping, and cutting, air arc gouging provides a much faster, more efficient, and more cost-effective means to remove unwanted metal. Air carbon-arc gouging differs significantly from oxy-fuel cutting (OFC) and plasma cutting. Air carbon-arc does not require oxidation to maintain the cut and is able to be used on many kinds of metal. Air carbon-arc gouging cuts and removes metal by an electric arc created a carbon or graphite electrode as it is drawn along the target metal. As the arc melts the target metal, a steady, high velocity air stream blows the molten material out of the way. The arc is supported by a constant current power source. 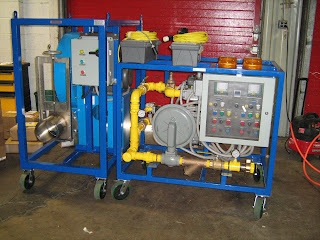 A compressed 60 to 100 psi gas source supplies the air stream. A special air arc torch is required, as it not only holds the electrodes, but has unidirectional air ports built in to direct the air stream. Air carbon-arc gouging will work on any material that will conduct electricity and which can be melted by the electric arc, such as carbon steel, stainless steel, cast irons, and many copper alloys. Metal removal rate is controlled by increasing the gouger’s amperage, slowing down the movement of the electrode, and by the efficiency of the air stream. Most common uses for air arc gouging are cutting, removal of defective welds, removal of bolts, removal of rivets, making holes, and casting finishing. Silicone rubber electric heating element for tank and vessel heating. Silicone rubber electric heating elements are well proven, tried and tested flexible heaters for heating plastic or metallic tanks and vessels. Their low mass offers virtually no thermal inertia and within minutes can achieve elevated temperatures. 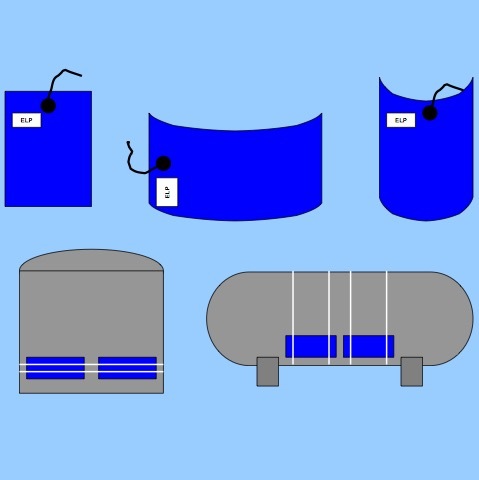 They are generally easy to apply to the surface of tanks, chutes, or hoppers and can be custom designed in virtually any shape, all that is required is a sketch of the heated area and information about the electrical connections. Silicone rubber electric heating elements are constructed by vulcanizing a nichrome heating element to the silicone rubber layer to produce a homogenous laminate. Two layers of 0.028” thick silicone rubber compound, sheath cured on one side, are calendared with high strength fiberglass mesh and vulcanized together under heat and pressure. 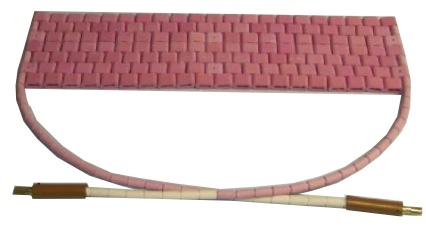 This bonding sandwiches the resistance heating element between the two layers. An electric grounding mesh is located on the assembly and a further layer of silicone rubber is applied and vulcanized, making a homogenous assembly. The heaters are used primarily for metallic and non-metallic tank and vessel heating. Their flexibility, both physically and design-wise, allow the heaters to be used for a wide variety of applications. Silicone rubber heaters are water-resistant and may be used for outdoor or “wet” applications, as long as the thermal insulation or exterior covering over the heaters is weatherproofed. Silicone rubber heating systems must be correctly temperature controlled. The controls and all electrical components must be approved for the area as classified. All wiring must follow Federal, State and Local codes and be fully compliant with the NEC as it relates to the project. If in doubt, please contact an industrial heating applications expert for assistance. For more information about silicone rubber tank and vessel heaters visit this link. Industrial furnaces are used for pre and post-weld heat treating by welders and fabricators to heat-treat weldments or metallic parts. Industries that require these types of furnaces include pressure vessels and piping, storage tanks, building construction, bridge building, offshore platforms, petrochemical plants, power plants, and oil and gas refineries. By using furnaces for PWHT, stress introduced by the welding process is reduced and redistributed through the heating, soaking and cooling the weldment/machined surface. This greatly improves the weld properties. PWHT is most times mandatory in order to comply with welding codes and specifications for the welding of carbon steels, stainless/high alloy steels and work hardened steels. Fairly sophisticated control systems carefully follow mandatory heating and cooling profiles, as outlined by welding code. 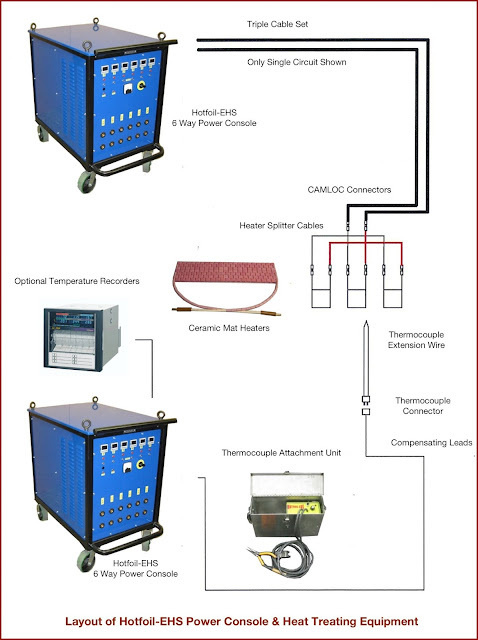 Control systems with thermocouples that monitor internal furnace temperature, along with weldment part temperature are usually included. These control systems also include the ability to ramp up to temperature and cool off over specified time intervals. 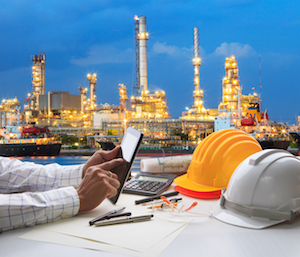 Finally, the use of recorders or data loggers is common for quality control documentation. Most pre or post weld heat treating furnaces are customized in one way or another, whether it size, total BTU output, energy source (electric, gas, oil), control scheme, door configuration, or having the furnace built on wheels or on rails. 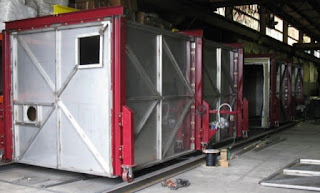 Furnaces can be designed permanently, portable, or field erected. By having the furnace local, or right on-site, companies eliminate the need to send parts out and thus save time and costs associated with shipping. Depending on the scope of work, its not uncommon for the investment made in a fabricated furnace to pay off within the first year. There are many different welding processes utilized in the welding industry today. Welding processes include stick arc welding, gas tungsten arc welding (GTAW), flux core arc welding (FCAW), shielded metal arc welding (SMAW), gas metal arc welding (GMAW), and air carbon arc gouging. 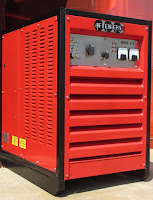 Most arc welding operations are performed using direct current from a DC power source an AC power source which has been rectified from AC to DC. 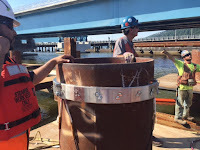 Many industries use these welding processes in a wide variety of environments including factories, construction sites, power plant construction, boiler construction and repair, and shipyards. 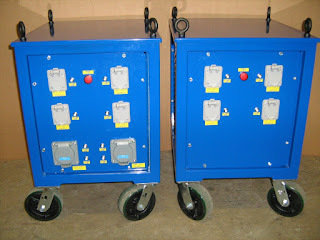 Multiple operator welding equipment was developed to allow several welding modules to operate from a single common power supply. The power supply typically includes a transformer and rectifier to step down the supply voltage, and then convert the power from AC to DC. Multi-station welding systems afford a number of advantages the principals of which are a lower initial capital cost, a much lower cost of installation, much lower maintenance cost and less power requirements as compared with single operator equipment. Multi-operator welding systems are practical and efficient as they provide a welding station where each welder has the ability to work. They provide for multiple simultaneous welding projects where workers can work efficiently and meet production deadlines. studs and pins to metal structures. Are you buying pre-made thermocouples? Do you know how easy it is to make your own? Are you always looking for a fast and easy way to attach studs or pins to a target structure? A thermocouple attachment unit (TAU) is the answer. TAU’s will help you save time and money in the fabrication of welding thermocouples and stud/pin welding. Thermocouple attachment units (TAUs) are small, self contained spot welders that achieve superior results for welding thermocouple junctions and attachment. They are portable and are easy to use. 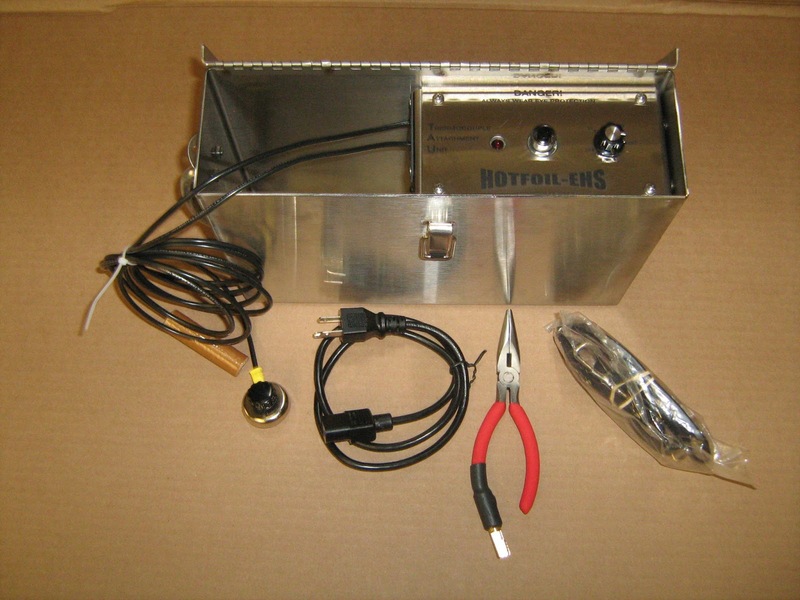 Also known as thermocouple welders, these units are provide a capacitive discharge (as the energy source) in a compact, self-contained, hand welding unit. They are designed to form very strong, free standing junctions in just seconds using standard thermocouple wire. There's no need for clamping, bracketing or strapping. TAUs provide a direct bonding method for thermocouples, pins and studs that is quick, easy, and low-cost while still providing accurate temperature measurement. Thermocouple attachment units continue to enhance their power outputs which creates more potential uses for TAUs. Higher power output opens doors to a broader application base. Higher power TAUs can be used to weld thermocouple pairs but also can be used to weld studs, rods and pins to a wide variety of metal structures. 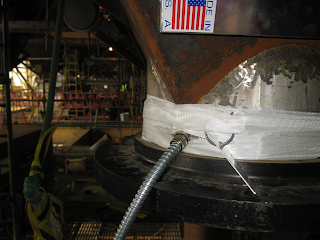 For example, a common use for TAU’s is attaching insulation pins to welding insulation blanket support. An internal power supply constantly recharges an internal battery giving the operator portability in field thermocouple welding. Readily available controls allow for easy adjustment based on wire size and material. Thermocouple attachment units offer a very convenient and economical method of forming and attaching thermocouple sensing wires, studs, and pins where and when you need them. Models vary based on requirements. Some models accommodate a greater range of wire sizes and materials, handling wire up to 14 gauge and capable of creating weld junctions in under a second. Because the power supply provides a short recharge interval, multiple welds can be done very quickly (4-6 welds per minute). Coal fired power plants must manage fly ash properly. 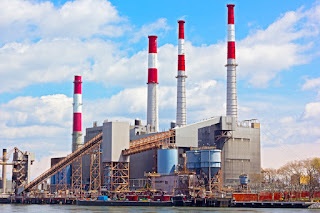 Coal fired power plants in the United States require the use of electrostatic precipitators or bag houses to filter out very fine fly ash particulate incorporated in the flue gas. The ash is collected as the flue gas passes through filter bags or by large electrodes, and then falls into collection hoppers. As the hot fly ash cools, condensate on the hopper walls can form. The mixture of dry, sulfur rich fly ash and water is very problematic, so it's very important to keep condensation from forming in the collection hoppers. The mixture of water and fly ash can cause clogging (or “pluggage”) in the throat of the hopper, and more importantly, the residual sulphur in the flue gas will combine with the condensate to form sulphuric acid. 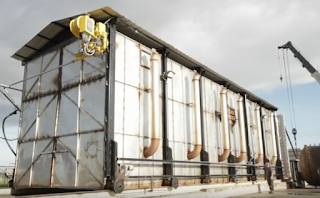 The suluric acid attacks the hopper walls from the inside causing corrosion, weakening the walls and creating significant (and costly) maintenance issues over time. Fly ash hopper with heaters. Efficient and continuous fly ash removal is critical for all coal fired power plants. Collection hoppers are an integral part of the removal process. 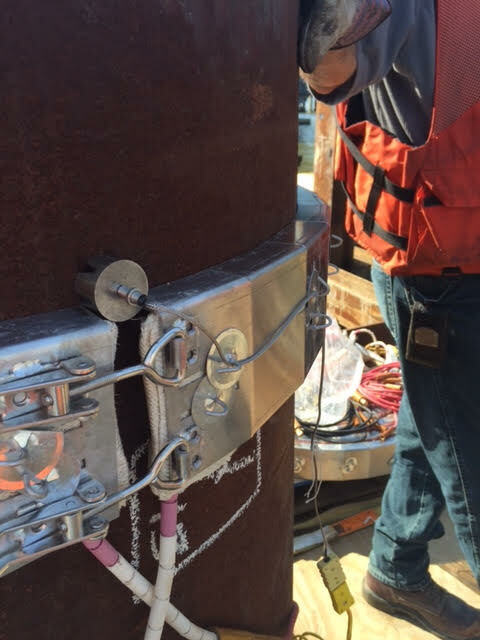 Pluggage or inoperable hoppers are a known issue to engineers and maintenance crews. The constant maintenance and excess of down time seriously hinder a plant’s ability to manage the fly ash production rate. Slower fly ash production means limiting energy production and efficiency. A power plant’s electricity production is directly proportional with its coal combustion rate which, in turn, directly effects the fly ash production rate. Plant maintenance personnel usually attempt to remedy ash system failures in real time by deactivating the affected hopper while continuing to generate power and ash. In some situations (to prevent boilers shutdowns) ash will be dumped on the floor, requiring costly clean up. The evacuation and management of fly ash is much easier when the ash is kept hot. One of the most common ways to maintain elevated fly ash and hopper temperature are electric hopper heaters attached to the external hopper walls. Hopper heaters play a very important role in the removal of fly ash from precipitators and bag filter hoppers by keeping the hopper temperatures operating above the flue gas acid dew point. The hopper heater’s sole function is to preheat the hopper and the internal environment to prevent the formation of moisture and the resulting clumping of fly ash and development of sulphuric acid. Flexible heating element used on hopper throat. Hopper heaters are designed for the dirty, high vibration environment of a power plant. They provide the optimum watt density for proper conduction through the hopper wall and for uniform heating. The are available in square, rectangular, and trapezoidal shapes to accommodate any hopper design. Ancillary flexible heating blankets are available for poke tubes, man-ways, and cylindrical throats. 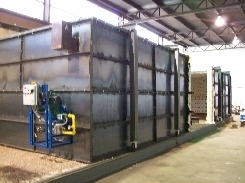 The use of electric hopper heaters on electrostatic precipitator and bag house fly ash collection systems is a time proven, effective way to prevent condensate formation and the resulting clumping and corrosive acids in hoppers, thus facilitating a better opportunity for uninterrupted fly ash production.